This had been a period of settling in and familiarising myself with the way of life here. I have moved to a one-bedroom bungalow, which will be my permanent home. And, I now have a kitchen and a garden. Your prayer support about my crate has borne some fruit. It left England in early June, and is now stuck on the Zambia/Tanzanian boarder awaiting some more paperwork … nearly there! Thank you! As well as getting to know people on campus - who come from all over Africa - I am meeting a number of locals, and, as is expected here, employ some. 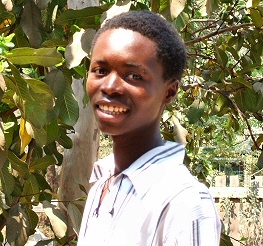 For instance, Emmanuel, the gardener, (who has already started a veggie garden for me), and Charity, who looks after the house 2 mornings a week. Both these people are the main breadwinners for their large families. Last month (July), brought a great deal of sadness to Mindolo when we lost Sharon Muchangwe, my line manager, who was killed along with her 12 year old niece, in a road accident, just outside of Mindolo gates. It was a reminder of just how fragile we are, and that our lives truly are in His hands. She was my immediate boss and a friend. I am temporarily taking up the reigns and visiting the participants on their fieldwork placements, until a more permanent replacement can be found. Please pray for the participants, and for her family who relied on her so much, and for the staff at Mindolo where she was valued greatly. I have now got several young friends who visit on a regular basis, for a chat, something to eat, and the hope of doing a small job to help pay their school fees/ living expenses. Richard and Samuel are both orphans, and are managing as best they can. Richard is also responsible for 2 younger siblings and grandma. Samuel has been on and off the streets since he was 7. They are very keen to learn about life in the UK, and although I try to play it down, there are poignant reminders that in some aspects we are worlds apart. For instance, Samuel, who has recently been made homeless again, went on an errand for me. After returning he asked to keep the shopping list; when I asked him why, he said he had never had a shopping list before, because he had never had enough money to buy more than one or two items at a time. A more disturbing example arose from a discussion with Richard, who was amazed to hear that people in the UK hardly ever go hungry (except by choice!). He then told me that his baby sister of a few months old died shortly after his mother; since they could not afford to buy her milk formula. A humbling reminder not to take even the smallest things for granted. Please pray for Richard and Samuel. That they will be able to complete their schooling next year (they are both grade 12) and that they will be get sponsorship for further studies. Samuel wants to be a Pastor and Richard a doctor. Both are bright and capable boys. On a brighter note, t was lovely to see Sandy Sneddon and Colin Renwick, from the Church of Scotland, when they came to Kitwe for a flying visit and took us out for a meal, - thanks Sandy! Visiting the local market is an interesting experience. It is a rabbit warren of a place where precariously cobbled-together wooden huts lean over, supporting each other and you have to negotiate gullies which are straddled by thin planks. The goodnatured stall holders are keen to sell you a cup of dried beans, or a few tomatoes for 1,000 kwacha (about 12p). There are also a vast array of stalls with second-hand clothes and shoes and the lovely colourful material Zambian women use to make their Chitenge (wrap skirts). I’ve bought some of this to make curtains for the bungalow. I have also discovered a real treat; a stall selling freshly ground coffee, hopefully I will be able to find it again if I take my bearings via local landmarks. Thank you again for your continued interest in world mission. 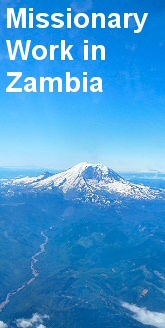 Your prayers and concern for God’s people in Zambia are much appreciated. And, they are a sign of your commitment to the wider church. With every good wish to you all.